After moving into our new home, we found that one of the showerheads in the bathroom to be clogged. Water from the showerhead was not flowing in the direction as intended and the settings were difficult to change. My best guess is a combination of an old showerhead (which was a Waterpik) and minerals from the water has blocked some of the spouts on the showerhead. The old showerhead visually looked like new, but the internals just didn't hold up. While on the search for a replacement showerhead, I noticed other solutions included a solution that you soak the showerhead in which claims to break up any sediment in the showerhead. After thinking about it, I decided this not to be a good idea. I wasn't 100% certain the solution did not contain any chemicals, and didn't think it was worth the risk of spraying myself with chemicals. Health over money. We'll be replacing the Waterpik with a Moen Refresh 5 Setting. And it's good to realize that Moen Showerheads have a lifetime warranty (for consumers) from drips or leaks. Make sure you save you receipts. Installation is simplest and the Moen come with an easy to follow instruction diagram. All you might need is a wrench to loosen the old showerhead in the beginning and tighten the new showerhead at the end. Removing the old showerhead may differ depending on the existing showerhead. The basic point is you want to remove the showerhead so all that remains from the wall is a short water pipe. If the existing showerhead is screwed on too tight, use the wrench. Next, screw on the bracket (which hold up the showerhead) to the short water pipe extending from the wall. 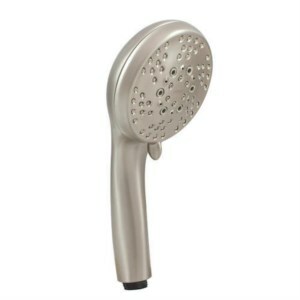 Most good showerheads will be equipped with washers/filters to insure a snug fit and prevent leaks. Use the wrench to tighten if necessary, but do not over tighten! From here, I screw on the hose, again making sure the washers (one at either end of the hose) are in place. Finally, screw in he Hand Shower. (again, another washer). During installation, I found the Moen connector pieces and showerhead external parts to be made of plastic. Made me a bit nervous that the pieces may break over longer use, but then I realised the Waterpik was also made of plastic and the outer portion looked brand new despite poor performance. I'll just watch and hope the Moen showerhead lasts the liftetime of usage. I'd rate this the easiest DIY fix I've done on the new house (compared to fixing bathroom faucet, recaulking bathtub, and attaching knobs on kitchen cabinets).